Imagine sub-zero temperatures and a hole in the ice. That is your entrance to the underworld of Ojamo, the most popular diving site in Finland. Ojamo lime mine is situated 60 kilometers west of Helsinki. It attracts thousands of visits every year. The mine area is part of the city of Lohja, known for its industry. The mining operations were started in the 1800th century. When the open pit got too deep, mining was taken into the tunnels. When Finland entered the war with Russia in 1939, the mine was turned into a prison camp. The prisoners worked in shifts and lived miserably in tents at the bottom of the open pit. There weren’t enough clothes for everyone, so the prisoners exchanged mantels between the shifts. Today, as the water has filled the mine, it seems just like another small lake inside the forest. The shallowest tunnels start at the depth of 28 meters, from the bottom of the open pit. 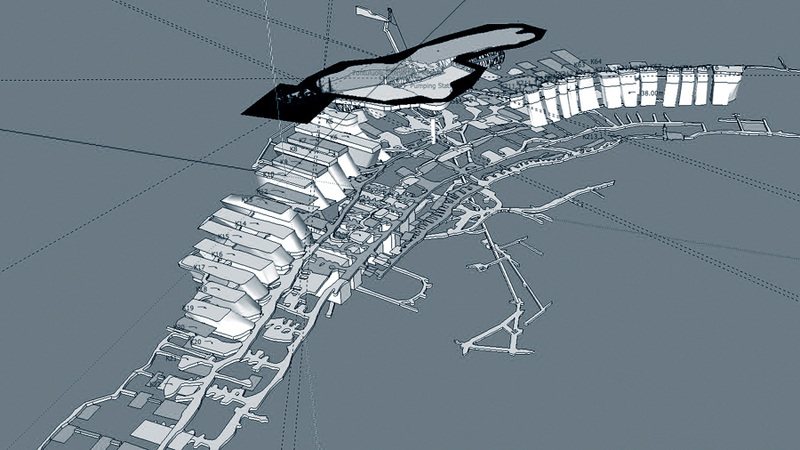 According to maps, the mine reaches the depth of 250 meters at the bottom of the main mining shaft. The water level reaching the ground level makes diving easy at Ojamo. Divers can park their cars next to the lake and jump into the water. There are many kilometers of tunnel at Ojamo, although the longest continuous stretch is only 1.7 kilometers, at the 88 meter level. There’s also little variation in depth on each level, the tunnels run almost horizontally. There are plenty of shafts and mining halls that are used for travelling from a level to another. All this makes planning dives easier than in a natural cave, as the multi-level plans can be reasonably accurate compared to natural tunnels going up and down all the time. It means that there are no reverse profiles either. In Finland, there are no natural caves suitable for diving. The ground is solid granite, which is too hard for water to carve underground rivers. Even the lime stone at Ojamo is tightly squeezed inside the hard rock where the carbon dioxide cannot eat its way through the stone. From the mine diving point of view, granite has many benefits. The corridors and vast halls are stable even without supporting structures. Ojamo mine has been dived for almost 40 years. The mining came to an end in the mid-1960´s. The market price for lime had gone down and there was no financial point in continuing the operations. As the mine was closed, it slowly started to fill with water. The good news was that the mine was filled with ground water, which had been filtered by the thick top soil and gravel. The water inside the mine tunnels was crystal clear. The northern lakes mostly lack large mammals and other animals, but perches, northern pikes and burbots quickly populated the open pit and its murky waters. The crayfish followed soon after. The early attempts to explore the mine were restricted by the primitive cave diving equipment. Finland was far away from the influence of central European and North American cave diving communities. 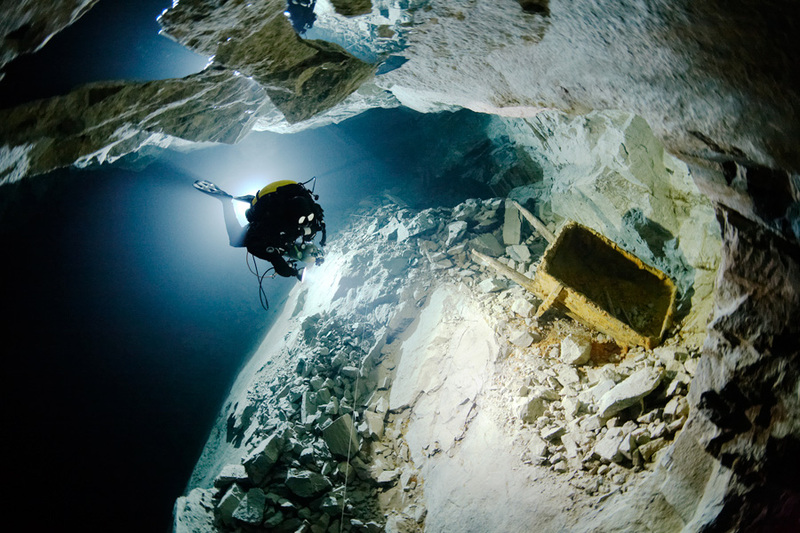 The diving was done mostly in Baltic Sea by military and professional divers, and they were not too interested in exploring in the mine very deep. Their techniques and equipment were tuned for wreck diving and typically lacked the redundancy and capabilities required for deep cave diving. In the beginning of 1990’s the mixed gas technical diving started to take hold. First non-military rebreathers were imported close to the turn of the millennium. The first expeditions charted the mining level at 28 meters. The largest part of the level became known as the Pearls, as 13 big mining halls are connected to each other with narrow passages. The level was suitable for open circuit nitrox diving, so it was mapped quite quickly. The next step was the 56 meter level. Air was still the most common diving gas, so the level remained well inside the air diving limits. It was explored all the way in the beginning 1990’s. The dives were considered remarkable by the standards of the time. Today, with all the rebreathers around, these two-three hour dives don’t seem anything but ordinary. A wheelbarrow has been left at the end of quarrying level. Some exploration was done at the 88 meter level at the early days, but the exploration came to a halt when the practical limits for open circuit dives were reached. It took a few years before the rebreather diving techniques were updated to the requirements of 88 and 138 meter level push dives. The 88 meter level was explored all the way to end beneath the Lake Lohja at 2008. After that, the focus has been on the 138 meter level. There are still plenty of tunnels to explore. Most techniques are similar to diving in natural caves. Divers follow maps when they dive in natural caves, unless exploring. Similarly, in a mine you typically have quite a clear idea of the routes, as the mines are well documented. Of course, the maps don’t reveal everything, and the 3-dimensional reality is often surprisingly different from the old drawings. The major limiting factor at Ojamo has always been the cold water. The constant 4 degrees Celsius at the bottom makes sure, that any dive over three hours is always a bit of challenge. Today, the heated vests and the fixed habitat make things easier. But even now, five or six hours in the chilling water can be torture, not to talk about if anything goes wrong with the suit. Dry gloves are imperative. Only the surface water in the open pit warms up in the summer time, to about 20 degrees Celsius. There are no currents, and the visibility at depth rarely changes. The surface water is a different story. During summer it’s all murky. The visibility drops to a meter or sometimes even less. Even that the decompression hours are warmer, the zero visibility poses a different challenge. There is silt, as in the natural cave. With no current, the ceiling in the previously undived sections can release plenty of silt when hit with bubbles. The mine is full of signs of the human presence. Tools have been laid down where the work was last performed. The rails and mine wagons still seem like they would be waiting for another cargo to take to the surface. At 138 meter level nothing has been touched. Layer of silt covers everything, but you can still recognize most details. The light bulbs hang from the ceiling, as if the lights would soon be turned on again. The hammers wait for their users. The neatly piled dynamite boxes seem like they were set there yesterday. In the open pit, the trees still stand. During the winter, when there is an ice cover on top of the lake, the light makes is own tricks. It is a wonderful scooter ride through the silent forest. It makes the long and cold decompression hours easier to manage.